Joy LaTorre, a nurse practitioner and part-time URI professor, knows first hand how stigma surrounding drug addiction affects grieving parents who have lost children to overdoses. “Some (parents) I’ve talked to feel like they don’t have a right to grieve because their children brought it upon themselves,” she said. She wants to change this. LaTorre and her team at Build the Banner of Love, hope to raise awareness of the “increased epidemic” of accidental drug overdoses, but more importantly, hope to be a source of love and healing for the families who have lost a child. 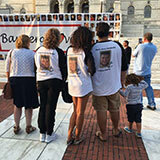 The organization hopes to display a “Banner of Faces” of those who have lost their loves from addiction at the State House to “empower” these families and keep awareness alive. Flaherty remembered LaTorre bringing her flowers and reaching out to offer support around the time of her daughter’s funeral in February. LaTorre has helped her not feel guilty and to overcome the stima of drug addiction that ofen puts the blame on the mothers,” she said. Lang, of Johsnton, lost her son Brian, 29, in October 2016. “He didn’t want to be an addict. Nobody wakes up one day and says “I’m going to be an addict,” she said. Lang remembers Brian’s four-year struggle with his addiction to Percocet-the last two years were particularly “horrendous.” She described terrifying times in which his girlfriend would call her and her husband in the middle of the night when Brian was having withdrawals. He had been through rehab and was clean about 50 days, but relapsed 10 days after returning home. Lang said that when he passed away, 20 of his friends held a three-day-long vigil for him in the hospital. “He was a very good boy. He just had a separate life that not many people knew about,” she said. 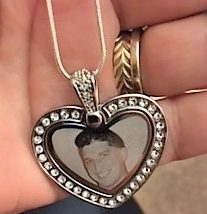 That Brian was an organ donor and has helped seven other people live, is part of what gets Lang and her family through losing him. “It’s hard to say that now. I can’t say I have three. I have four children, but one passed,” she said. 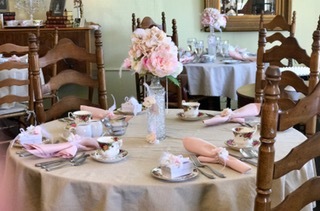 She also takes solace in her Catholic faith, Grief Recovery meetings that convene other parents who have lost their children to drug addiction, and through LaTorre’s efforts. Lang said she was thankful to have her son for 29 years; Flaherty had her daughter Shea-Lee for 18 years. Flaherty believes Shea-Lee began using pills at the age of 16 before she started using heroin. She said she found it difficult to assist her daughter in finding help because of her age and that her daughter passed away the night before she was scheduled to go into a rehabilitation facility. “When an addict comes in and says they need help, it’s always, “we’ll help you tomorrow. ‘Because it is such an epidemic, they don’t have room for anybody…. You need some kind of support.” She said, going on to describe numerous drugs that were found in her daughter’s system on the day where she was told she needed to wait before getting to a rehabilitation center. Somebody needs to be able to have a say in your life when you’re that bad. A lot of times I was turned away because she was 18. Neither Flaherty nor Lang feel embarrassed, ashamed or disappointed d by their children, and both emphasize the importance of talking about drug addiction. “Nobody thinks it’s going to happen to their child or to someone in their household, and then all of a sudden that person is gone and they’re never coming back,” Lang said. LaTorre agrees. “This epidemic crosses all races, religions, social status and age, none of which is a common denominator,” she said. As for why she does all of this for strangers, LaTorre said, “I do the things that I do because that is what love does.” Construction of the Banner of Love will begin in late June or early July. For more information about the Banner of love and how to contribute photos of loved ones visit www.buildthebanner.org.